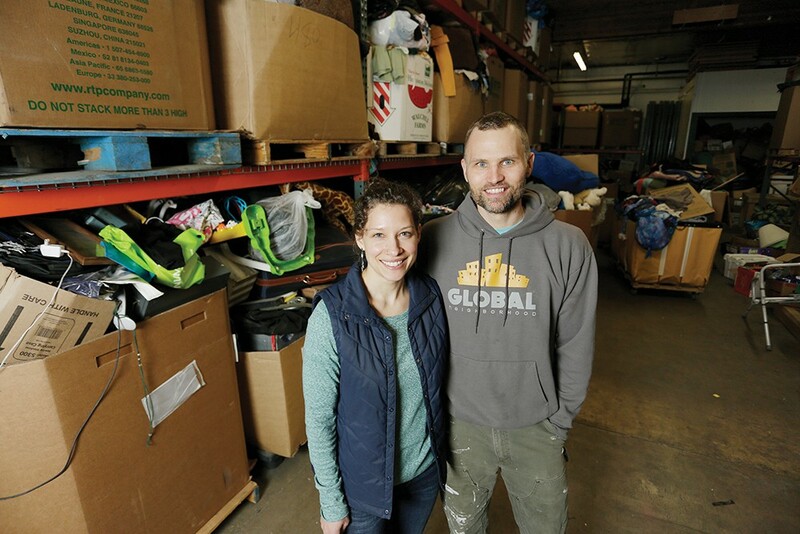 Amy and Brent Hendricks' Global Neighborhood thrift shop helps refugees in Spokane gain job skills and cultural understanding. A job in America is more than just money in your pocket. It can be how you define yourself. It can be an educational experience. It can be your ticket to bigger and better things. It can be the beginning of that sacred and elusive idea we call the "American Dream." At Global Neighborhood, it might be all of those things for the employees. The thrift store is a place for refugees from distant corners of the world to learn job skills. But it's also where they can learn American customs and language skills, all while earning an income. This spring marks an important milestone for the nonprofit and its founders, Brent and Amy Hendricks, as the store moves to a new location on Trent Avenue, nearly doubling its footprint to about 11,000 square feet of retail floor space. Since opening the thrift store seven years ago, 119 people from 29 different countries have come through its job readiness program, and it employs as many as 20 people at a time. "They're people who are motivated and hard working and they just need a chance to get their foot in the door," Brent says. "So, we're in the business of providing opportunities for people." "We're trying to create an environment where people can safely figure out how to work, without the threat of their job ending," Amy says. And what better way than to put them in a thrift store? "I feel like retail skills, more than most other occupations, have transferable skills," she adds. "It's customer service, it's cash handling, it's following directions, it's ordering things. Let alone, it's a thrift store, so it's a cross section of our culture and all our stuff." As Brent tells the story, shortly after college, he and his roommates invited some Eritrean refugees to room with them while the refugees awaited a permanent housing situation through World Relief. As he got to know the guests, who were about his age, Brent learned they had been child soldiers who escaped a prisoner-of-war camp. That's when things became personal, he says. He could have been in their shoes. As Brent and Amy continued to work with World Relief, they noticed that even after local refugees had been resettled and become somewhat established in Spokane, many of them didn't have the resources to succeed. So the couple established Global Neighborhood, not as a thrift store, but as a way of connecting newly settled refugees with services and matching them with other established families for support, Brent says. Still, even after settling and becoming somewhat established in Spokane, many of the refugees were leaving. "They were moving to Oklahoma or Ohio or Texas. This was right at the start of the Recession, so things were going downhill pretty quick," Brent says. "We had friends who were moving their whole family across the country for one minimum wage job." The refugees had support, but without a job, they couldn't live independently. "They would say, 'I know I need to learn English, I know this is important, but it's the 28th, and my rent is due in three days. So first you need to help me find a job,'" Brent recalls. "That was a turning point for us." The Hendricks had a storage shed in which they had been amassing a sizeable collection of donated goods that they didn't know what to do with so, Brent says with a laugh, they figured they'd start a thrift store. "We've been going full speed down that road ever since," he says. The Hendricks realize their mission is not as simple as hiring and training people. Part of it hinges on politics. There are still more than 25 million refugees worldwide, according to the United Nations Human Rights Council. Meanwhile, the upper limit of refugees allowed into the United States under the Trump administration has been slashed to 30,000, the smallest since the Refugee Act of 1980, according to the Center for Migration Studies. From a jobs/economics standpoint, the Hendricks are frustrated as they see the local economy losing out on potential employees who are eager to work. From a personal standpoint, they're frustrated because they know the challenges that refugees go through. But the couple's work goes on. They say the process of resettling in America can take decades. Ultimately, it's about future generations, Brent says. "Usually we hear, 'I want my kids to have a better life, I want my kids to go to college. Someday I want to own a home,'" he says. "It's really the closest thing to the stereotypical American Dream." He has a master's degree. He and his wife started a business. But he is only able to say that because his grandparents immigrated to the U.S. from Europe in the aftermath of World War II. "How we treat people is going to have an impact on the future generations and what their opportunities are," he says. "It takes a whole community of support and we're just doing our part." The original print version of this article was headlined "More than a Paycheck"